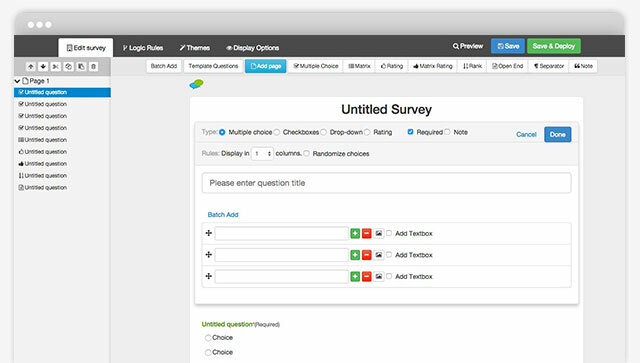 SurveyPie, the easy to use online survey tool. YGWYS interface. Click to create professional surveys. Easy-to-use edit panel largely increase efficiency. Over 10 question types available. Tree-from panel for you to adjust survey structure. Drag to change questions orders. Add logic rules to questions or choices. Get accurate data from independent collectors. Collectors with no top limits. Set up collectors for different respondents groups and get 1 link for each collector. When should I use collectors? Integrate surveys to social websites. Set up collectors for Facebook and Twitter. API, the best solution for website users. A special collector for websits/Apps who has independent user system. View results with tables and charts. Analyze respondents' behaviours to help improving survey contents. Source report tells you which source is more effective. Export report and raw data as spreadsheet. Share report via links to keep your team members updated.